An illuminated check engine light on your Nissan can signal anything from a loose gas cap to a major repair. At Speedcraft Nissan in West Warwick, we’re often asked about why it turns on and what to do about it. The good news is that staying on top of regular maintenance will help you avoid big problems. Take your car in right away when that stress-inducing light comes on. It might not be a big deal. One thing NOT to do? Ignore it. Let’s run down common causes. An oxygen sensor needs to be replaced. This may be one of the most common causes of check engine lights turning on. Oxygen sensors read unburned oxygen in your exhaust system, and a faulty sensor will cause your Nissan to burn more fuel and may damage your spark plugs. Faulty mass airflow (MAF) sensor. When an MAF sensor goes out, your Nissan isn’t able to properly measure the air that enters your engine to determine how much fuel to burn. Therefore, you’ll burn more fuel and have limited power, potentially harming spark plugs, oxygen sensors and the catalytic converter. Worn-out spark plugs. Spark plugs ignite the fuel-air mix that makes your Nissan go. Ignoring this problem may result in a clogged catalytic converter. Loose gas cap. A gas cap maintains the proper pressure in your gas tank. If it’s broken, missing or loose, the check engine light will come on. Catalytic converter needs replacing. The catalytic converter protects the environment by converting the carbon monoxide into breathable carbon dioxide. Performance will suffer and you won’ pass an emissions test if the catalytic converter goes out. If that annoying check engine light goes on, get it checked out. 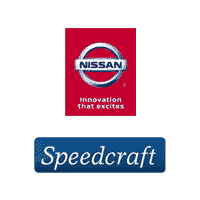 We’re here to help at Speedcraft Nissan, where we can diagnose a check engine light and perform brake repair, battery and electrical services, tire rotation, oil changes and numerous other services. 0 comment(s) so far on Why Is My Nissan Check Engine Light On?